When Tata bought Jaguar and Land Rover it spelt the end of the Premier Automotive Group, the association of Ford's premium brands. The only one left was Volvo, the Swedish car maker that Ford had acquired in 1999, and its sale would soon follow. In 2010 it was acquired by Zhejiang Geely, which became the first Chinese owner of a major European motor manufacturer. The new Volvo V40 was signed off for production at the first board meeting after the takeover. It was ready, developed within Ford's Global Shared Technology programme, and represented something that Volvo hadn't had before: a mainstream five-door hatchback. Volvo had always taken pride in offering cars that bridged the conventional size and price classes. Stefan Jacoby, recruited by Geely from Volkswagen to be chief executive, thought this was nonsense and declared that henceforth, Volvo would compete on equal terms with its rivals. Evidently Volvo's last Ford management thought the same, as the V40 had been designed from the outset as a class competitor with the VW Golf and Ford Focus  or, as Volvo saw it  the premium Audi A3 and BMW 1-series. The parallel with Audi is appropriate, as the coupe-styled V40 is to Ford Focus what the A3 is to the Golf: the same underpinnings but in a classier, more expensive package with a few unique innovations. Jacoby was keen that Volvo should capitalize on the reputation built over many years by its most expensive model, the XC90: safe, versatile and rugged but without the macho image of a fully-fledged SUV. Rather confusingly, as well as XCs, Volvo offers Cross Country models which have raised ride height and some extra exterior cladding but less off-road capability. And this is where India comes in. Volvo recognizes that a conventional five-door hatchback might be difficult to sell here but thinks that the jacked-up V40 Cross Country could be just right for India's sub-standard road conditions. The critical changes that make a V40 into a Cross Country are raising its suspension by 40mm, fitting skid plates front and rear with matching side sills, and tougher black plastic, rather than body-coloured bumpers. The grille is a more assertive black honeycomb moulding and there are integral roof rails. Other than trim colours there no changes to the interior. The differences from the standard car are hardly noticeable, although one is aware of sitting just bit higher  and the extra ground clearance is useful. The powertrain choices are the same  ranging from 1.6-litre four-cylinder diesel (with tax-beating 99 g/km CO2) and 1.6-litre petrol to two versions of Volvo's 2-litre five-cylinder diesel and the 2.5-litre five-cylinder petrol engine developing 254PS. All engines are turbocharged and come with six-speed gearboxes. The 1.6 petrol and higher output diesels can be specified with a torque convertor automatic transmission, while the top T5 has a twin-clutch automatic which Volvo calls Geartronic. For the Cross Country, the T5 combines this with four-wheel drive; surprisingly, this is not offered with the bigger-selling diesel engines. Previous experience told that the standard V40 has similar driving characteristics to the Focus  which is praiseworthy  and even has a slightly better ride on UK roads. But the more powerful versions have an unfortunate tendency to generate torque-steer when accelerating hard on a less-than perfect road surface. What we needed to know was how much the ride and handling was altered by the additional height and what effect the four-wheel drive (a clutch system which directs torque to the rear when it senses wheel-slip) has on its behaviour on normal roads. So we ventured out on rainy country roads in the south of England in a T5 Cross Country AWD. And we were impressed. The T5's 254PS puts it near the top of the horsepower league in this class and it has sparkling performance against the clock: 0-100 kmph in about six seconds and a top speed of 235kmph. Four-wheel drive makes a serious difference; the torque transfer cancels out the steering fight of the front-drive version. With big, 18-inch, wheels, some deterioration of the ride might have been expected but the opposite was the case and the steering, a bit more weighty than other V40s, retained its good feel. Our only major criticism of the T5 AWD is its price. In the UK this top model of the V40 range is Rs 28 lakh  more than an Audi S3 - and with a full complement of options it climbs over Rs 33.5 lakh, the price of an RS3. Fortunately, prices of the front-drive diesel versions are more reasonable, starting under Rs 16.74 lakh. The Cross Country equipment and specification adds Rs 83,000 to the price of the regular five-door. And there is no downside to the way they drive. 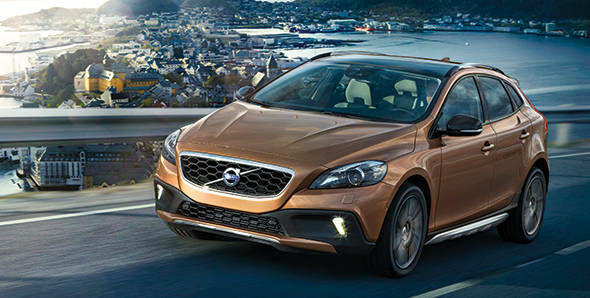 Naturally, the V40 plays to Volvo's strengths in safety matters and restrained Scandinavian design. All versions have the unique pedestrian airbag, which in the event of a collision pushes up the rear of the bonnet and forms a cushion in front of the windscreen, and City Safety, the system that applies the brakes if the driver fails to react to an obstruction. The optional (Rs 1.5 lakh) Driver Support pack includes pretty well all the latest safety kit, including collision and blind-spot warning, active high beam and parking assistance. The cabin design is cool and neat and offers the novel feature of a configurable instrument panel where the colour and information display can have three themes: elegance, eco and sport. After the V40, it is all change for Volvo. Stefan Jacoby has gone, replaced as chief executive by another board director, Hakan Samuelsson. The Ford parts bin will not be available for future models, which will be built using its own Scaleable Vehicle Architecture (SLA), a new range of four-cylinder engines called VEA, and an eight-speed automatic transmission. The first car to be based on SLA and VEA will be the next generation XC90. But, right now, Volvo's Chinese owners are banking on the V40 to revive sales. They were six per cent down last year (to 422,000), partly because of the depressed European market but also because of phasing-out the C30, S40 and V50  the three 'in between' models that the V40 was designed to replace.